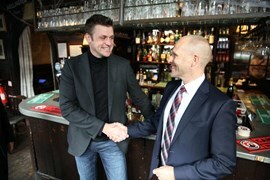 Image of INEOS Automotive CEO, Dirk Heilmann and MB Tech Managing Director Henry Kohlstruck signing the deal in the historic Grenadier Pub, where the idea for Projekt Grenadier first originated. German company MBtech, a subsidiary of Mercedes Benz, has been awarded the engineering contract for INEOS Automotive’s planned 4x4, announced in September 2017 as Projekt Grenadier. The appointment represents a significant step forward in the realisation of INEOS’s plans to build an uncompromising world class 4x4 vehicle. Over 200 German engineers will be working full-time on the project in Stuttgart by spring 2018. INEOS Automotive and German engineering company MBtech have struck a landmark deal which will see the companies officially partner to develop Projekt Grenadier’s vehicle. MBtech was founded in 1995 as Mercedes-Benz Technologies. Although the majority of its work remains with Mercedes-Benz, MBtech also works with a wide range of other automotive clients, including Porsche and BMW. The company will take the lead on overall vehicle development overseeing all components of the upcoming 4x4. MBtech will begin work to take the initial design concepts through to a fully engineered vehicle and will be producing the first mule vehicles, followed by prototypes, later in 2018. It will be responsible for working up the exact specifications of the vehicle to ensure that it is a truly rugged, reliable and uncompromising 4x4. The official partnership agreement was signed between INEOS Automotive CEO Dirk Heilmann and MBtech representatives in the historic Grenadier pub in Belgravia, the birthplace of the Projekt Grenadier concept. The partnership represents a major step forward for Projekt Grenadier, as automotive experts and engineers officially begin work on design and build to a tight project timeline. By the spring, over 200 world-class engineers will be working full-time on the project near Stuttgart, Germany, one of the vehicle development capitals of Europe, complemented by significant growth of the INEOS Automotive team in London. Henry Kohlstruck, Managing Director of MBtech, said: “All of us at MBtech are looking forward to getting involved in this once-in-a-generation opportunity to develop a truly uncompromising off-road vehicle. The next six months are where the real work will begin as we take all the design variables into account. Our key competencies lie in developing SUVs and 4x4s, and we are very excited to be given such freedom and responsibility to help complete a fantastic automotive project.” Work on the designing of the car can now officially begin, with a target agreement on the car’s specifications expected by mid-2018.